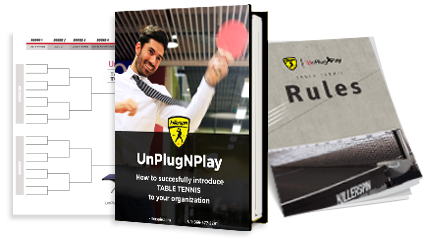 We challenged ourselves to disrupt the way you think a table tennis table should look like, then we challenged ourselves to build this top of the line ping table. Our dedication to perfection will make your ping experience memorable, while the clean lines and bold design win you over! All this comes together to make the Revolution SVR - Silver1 the absolute best high end table available for sale today. A dream table, awesome looks and great to play on! Initial issue was handled professionally and I will definitely buy more Killerspin products! I was involved in the order process for one of these tables for someone who needed one delivered overseas immediately in order to have it on time for an event. I felt very compelled to write a review of our customer service experience. I was helped by "JJ" who went above and beyond for us in every detail of what we needed. She exceeded our customer service expectations by many times over, especially with her attitude! We gave her a lot of "trouble" as there were many details involved pertaining to the expedited shipping we required. JJ remained pleasant, unbothered and genuinely happy to help us throughout the entire process. JJ and Killerspin earned a 5 star review before even taking the seemingly unmatched table into consideration. Thank you JJ and everyone else from the warehouse team that helped us. God bless you all. I've had this table for 7 months now and it is solid. Once assembled, this table is extremely heavy and very stable. The table halves connect perfectly with the surface drawn lines flowing seamlessly together. The table halves can be matched and balanced precisely with a leveler. After several months of continuous use with leaning and running into the table during play, I checked again if the table was still balanced with a leveler and the result was solid. Top quality. This is an incredible well built table. It is also the most stylish table you will find on the market. This is absolutely the best table tennis on the market. I researched all of the top of the line tables and there is nothing out there that compares to this one. From the aesthetics to the quality of the contruction - simply the best. I've contacted Killerspin for questions concerning additional products and they are great to work with - excellent customer service!